Oh the dreaded 50 point rule! Dan McCormick was again forced to lose riders to get with in the limits, Kristian Praestbro eased the situation a little by announcing his retirement from British League racing before the season started and Dan decided that Bobby Schwartz was the other man to go. Bobby was off to Reading, who went on to win the Championship with his help. The big disappointment though was that he was unable to use some of his talented contracted riders such as Dave Perks and Mike Sampson because of the regulations and had to make up the team with novices early on. It still looked strong though with Bruce Penhall, Phil Collins, Erik Gundersen and Alan Grahame as the spearhead. Bruce was magnificent making a fine inspiring skipper despite a few injuries. Phil Collins, never a good gater improved tremendously and became a fine heat leader. Gundersen improved on the exciting potential he had already displayed and just edged out Alan Grahame for the third heat leader spot. This top end should have taken the Heathens to the top of the League but the lack of strength at the bottom end of the team held them back a little. As well as this a broken collar-bone kept Phil Collins out for a time, he was replaced by Dave Perks but he suffered back injuries which kept him out for the rest of the season. 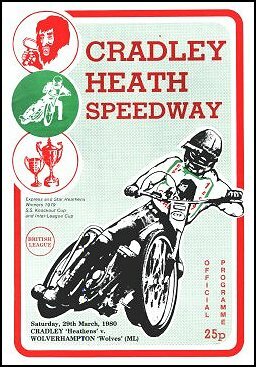 Until Phil was hurt Cradley were up there challenging near the top of the League, but although unbeaten at home the Heathens away record was poorer than expected. However the KO Cup came back to the cupboard again after a tremendous Final with Belle Vue after losing by 26 points in the first leg they slaughtered the Aces at Dudley Wood by 42 points. 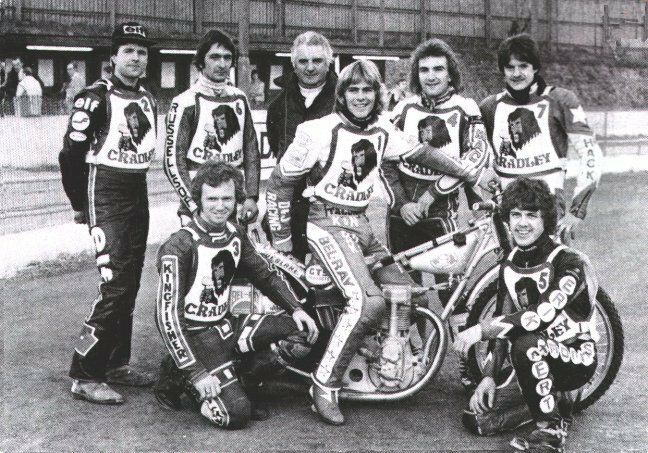 They were knocked out of the Inter-League Cup in the semi final by Kings Lynn but won home and away against Coventry in the Midland Cup, the first time Cradley had won the regional competition. They also beat Wolves in the Dudley Wolves Trophy. In individual events at Dudley Wood, Penhall won the Midland Riders semi-final with a brilliant maximum. Chris Morton won the Golden Hammer, Penhall retained the Golden Helmet before losing it to Hans Neilsen in the deciding leg at Birmingham. Bruce also reached his first World Final finishing fifth at Gothenburg with nine points. Dan McCormick left Dudley Wood after a disagreement with the management and took charge of nearby Birmingham. John Hack was involved in a crash at Monmore Green and suffered head injuries so severe that he was left struggling for life, he slowly recovered before announcing that his racing career was over. Ila Teromaa 8, John Grahame 3, Dave Perks 0. Glen McDonald 0, Hans Albert Klinge 0. Dave Perks 4, John Hack 3. Ila Teromaa 5, Craig Featherby 2. John Hack 2, Glen McDonald 0. Steve Lawson 3, Craig Featherby 2. Steve Lawson 5, Craig Featherby 2.